Our TSA-India program is in crisis management mode, and for one sole reason: wildlife trafficking. 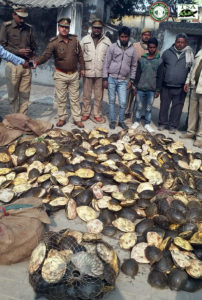 Nearly 9,000 turtles representing 7 species have been intercepted from wildlife traffickers in the last two months by the law enforcement authorities of Uttar Pradesh and West Bengal, India. One species in particular is taking the brunt of this illicit trade: the peculiar-looking Indian Flapshell (Lissemys punctata). Of the nearly 9,000 turtles rescued, approximately 95%, or 8,031, of these have been Flapshells—destined for the meat and medicinal markets of East Asia. 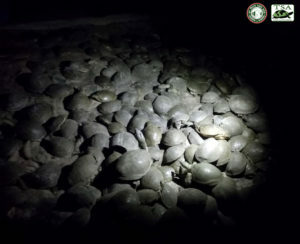 1,583 Indian Flapshell Turtles were intercepted by authorities in the early hours of 16 November 2018. The Indian Flapshell Turtle is an aquatic generalist and its habits make it an easy target for poachers. Pictured is a rare leucistic specimen confiscated from illegal trade. On account of the relative ease with which the turtle is captured, coupled with a rising demand for turtle meat in eastern India, as well as foreign destinations such as China, Hong Kong, Singapore, and Indonesia, Singh estimates that as many as 70,000 Flapshells were poached for international shipment from India in 2018 alone. This is despite the fact that trade of Indian Flapshells is regulated by Appendix II of CITES. In this critical atmosphere, law enforcement officials and our TSA-India program technicians are treading water just trying to keep up. Since 29 October 2018, there have been 20 seizures of turtles in north-central and eastern India. Of those, 17 have been in the state of Uttar Pradesh; the headquarters of TSA-India, where our program presence is the strongest. With 85% of the confiscations we’ve dealt with occurring in this state, an unfathomable number of turtles are most likely being smuggled out of the country from the other Indian states. Flapshell Turtles are inhumanely bundled together for the meat and traditional medicine market. According to Singh, the uptick in seizures during the winter months is attributed to numerous factors. “Winter festivals throughout the country provide a distracting environment for law enforcement, allowing more shipments to go undetected. Furthermore, the cooler temperatures slow the metabolic rate of the animals, meaning they move about less, require less oxygen, and can go longer periods of time without food or water.” Additionally, says Singh, “If turtles die in transit, putrefaction is suppressed, so there is a lower chance of authorities being tipped off by a pungent smell.” Despite this, law enforcement officers, aided by the TSA, have been able to intercept nearly 10% of the estimated annual harvest of Flapshell turtles. While seemingly low, this number is on par, or greater than that of law enforcement agencies in other countries where turtle trafficking is a problem. 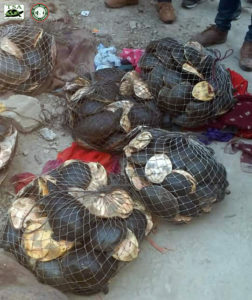 An illegal shipment of thousands of Flapshell Turtles is intercepted by the Uttar Pradesh Special Task Force. Confiscation numbers this winter have ranged from 80 to 1,583 animals per event. The length of time necessary to amass a large enough quantity of turtles for shipment depends on a variety of factors such as local population density, hydrological conditions, and man-power. It could take anywhere from a couple days to a couple months to collect a large quantity for export. Once captured by poachers, it’s nearly impossible to know exactly how long each turtle or group of turtles has gone without proper care and living conditions prior to their seizure. However, based on the early summer and early autumn harvest seasons, one can likely guess that any given consignment of turtles has been held in poor conditions anywhere from 2 to 6 months. On top of that, the turtles, typically packed into burlap sacks or mesh bags, are estimated to endure further inhumane transport for 1-2 weeks before being intercepted by authorities and released from their woven bindings. By the time our TSA staff responds to seizures to provide triage, the turtles are under a state of great physiological and psychological stress and trauma, are often afflicted by shell and skin damage, and in some cases, have even contracted illnesses. Many have already died by this point, and that number undoubtedly grows as time progresses. “I would say approximately 20% die in the first week following their seizure, while we suspect another 30% may perish after their release due to long-term physiological stressors and illnesses acquired during their harvest and shipment,” says Singh. Each turtle receives a veterinary assessment and is prescribed a treatment regime at the Kukrail Gharial and Turtle Rehabilition Center. 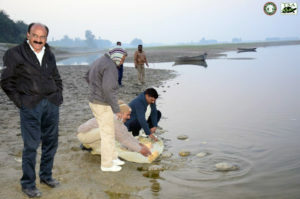 Once cleared for release, turtles are freed into protected waters in Uttar Pradesh. The numerous confiscations and thousands of animals placed under our care this winter has put excessive pressure on TSA-India’s personnel, facilities, and monetary resources. 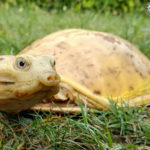 As of this writing, the Kukrail Gharial and Turtle Rehabilitation Center is at maximum carrying capacity for confiscated Flapshells, and we don’t foresee the trade in these turtles letting up anytime in the near future. 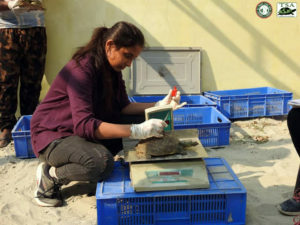 Despite the pressures placed on our program and the crowded conditions of our rehabilitation facilities, the TSA-India staff and volunteers will continue to ensure that each turtle is attended to and given a fighting chance for survival. 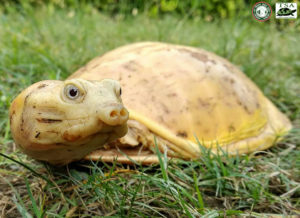 To support the TSA’s efforts for turtles rescued from the illicit black market trade in India, we recommend contributing to our campaign specifically designated to helping the turtles of India affected by the illegal wildlife trade. Awesome work. What actions are being taken against the poachers? This needs to end on a global level and all poachers need to serve prison time.